It may seem easy to just get all your tree trimming done by yourself, but it’s best left to the pros. The trimming and shaping of trees is essential to their life, safety, and appearance. Pruning and shaping may seem like a tempting project to take on yourself, but the margin of error is greater than you might think so it’s best left to certified professionals, arborists. Sloppy and improper pruning can lead to damage of the tree, weakening the tree and potentially shortening the life of the tree, which are just some of the many perils you may face if you don’t perform tree trimming properly. Most routine tree trimming is put into action to remove weak, diseased, or dead limbs. This can be accomplished at any time during the year with little effect on the tree. As a rule, growth is maximized and wound closure is fastest if tree trimming takes place before the spring growth flush. Some trees, such as maples and birches, tend to almost leak sap if pruned early in the spring. It may be unsightly, but it is of little consequence to the tree. However, trimming, just after the spring growth flush should be avoided. At that time, trees have just expended a great deal of energy to produce foliage and early shoot growth. Removal of a large percentage of foliage at that time can stress the tree. Lion’s Tailing is the over-pruning of the interior branches of a tree’s crown. This unbalances the crown, distributing future growth towards the branch ends and shifts the tree’s center of gravity higher. Between the center of gravity change and weaker branch structure trees that have been lion’s tailed are more likely to snap easily during storms. Lion’s tailing may also result in sunburned bark tissues and waterspouts. Climbing spikes are sharpened steel spikes used to help tree care providers climb trees. These spikes actually puncture the tree’s bark and cause tree tissue death as well as open wounds that can lead to insect infestation or disease infection. Climbing spikes should never be used when trimming a tree. Instead, professional tree service companies use proper tree trimming techniques and equipment such as ropes, climbing harnesses, aerial lift devices, and cranes. So, leave it to the professionals! Ready to have the beautiful yard you’ve dreamed of? Harford Tree Experts & Landscaping, Inc. has been in the business for decades, providing customers with quality work and quick responses all at the right price. 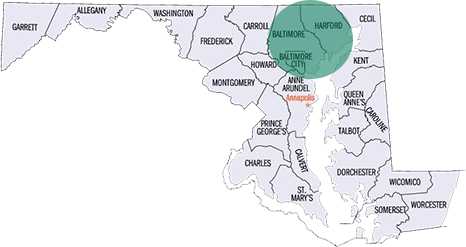 We service the areas of Harford County, Baltimore County, Baltimore City areas including Bel Air, Fallston, Perry Hall, Towson, Essex, Parkville, White Marsh, and Middle River. For service during our business hours, reach out to us or give us a call at 410-592-7321. We also offer 24/7 emergency service, just give us a call at 443-250-6649. For updates about our business and more informative tips, follow us on Facebook, Twitter, and Google+. This entry was posted on Friday, October 6th, 2017 at 1:53 pm. Both comments and pings are currently closed.